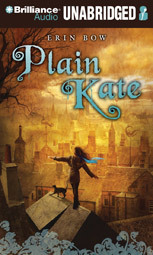 I have been wanting to read Plain Kate by Erin Bow since I first heard her read an excerpt from it at the Eden Mills Writes Festival in September 2010. This is the story of young Kate Carver, the daughter of a skilled wood carver who has died long before his time. Kate is now left alone in the world, a world where superstitions run high, where magic and curses are believed. The ability of carving is held in suspicion, though many believe that a particular type of carving can ward off evil. Without the protection of the Wood Carvers Guild, Kate can't make ends meet. She longs to escape her village and find a safer place to live and possibly even an apprenticeship with a qualified carver. Instead she meets Linay, a stranger to her village. He promises to give Kate what she needs and most desires, if in exchange she will give him her shadow. Once she has accepted his offer, she finds that it has only made her situation that much more desperate. Kate is obviously a child prodigy when it comes to carving, yet that is not enough to ensure her a good wage, nor to secure her a position in the Wood Carver Guild. There is politics to be played just as there often is in the real world. She is accepted when people have need of her skill at carving protective charms, but they are just as quick to turn their backs on her when they need a scapegoat. These are a lot of lessons to be learned at a young age. Even with these troubles following her, Kate is invited to travel with the Roamers, a collection of families that live and travel together. Interesting that strangers will welcome her into their midst while people who have known her all her life readily turn their backs on her. I thoroughly enjoyed listening to this story. 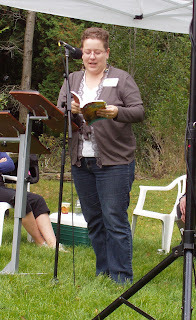 It was read by Cassandra Campbell. You can listen to a sound clip of the un-abridged edition at Brilliance Audio. 8 hours 45 minutes. This would be a good book to read with your pre-teen. Photo taken at the 2010 Eden Mills Writers Festival. 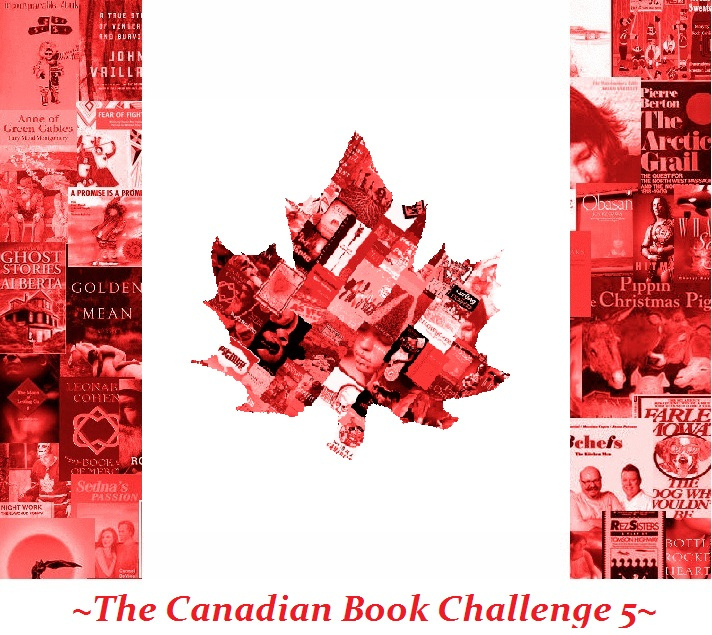 This is my 16th read for the Canadian Book Challenge which is hosted by John at The Book Mine Set. Thanks to Brilliance Audio for use of the cover image. My daughter and I both enjoyed this book very much. I hope it gets the attention it deserves outside of Canada.